According to the World Risk Report, inadequate and inefficient infrastructure and weak logistic networks significantly increase the risk for an extreme natural hazard to backslide into a disaster. Philippines lies along the Pacific Typhoon Belt and is within the Pacific Ring of Fire. The geographic location of the country exposes it to natural hazards. In fact, in the 2017 World Risk Report, Philippines ranked 3rd amongst 171 countries in terms of risk associated to natural events and exposure to natural disasters. Bridges in particular have been proven to be highly vulnerable. As per the report of Department of Public Works and Highways Secretary Mark Villar, from July 2016 to June 2018, the government has completed the retrofitting/strengthening of 642 bridges spanning 29,260 meters, rehabilitated 939 bridges spanning 40,191 meters and replaced 204 bridges spanning 8,305 meters nationwide. Apart from this, the Duterte Administration has widened a total of 511 bridges, spanning 23,928 meters and constructed 127 new bridges. This includes the replacement of the 365-meter Lisap Bridge along Calapan South Road Bongabong, Oriental Mindoro, connecting Barangay Lisap and Barangay Hagan which was completed in February 2018 and the widening of the 650-m Governor Miranda Bridge II, which serves as the main access of motorists from Davao City to other parts of the Davao Region. The widening of the 140-meter Davao River Bridge (Ma-a Bridge) along the Davao City Diversion Road was also completed in April 2018. Travel time has improved between Barangay Ulas and Barangay Buhangin by 62.5 % from 80 minutes to 30 minutes, benefitting 31,576 motorists per day. Also, completed in May 2018 was the 360-meter Anduyan Bridge in Tubao, La Union, which connects Anduyan – Rizal – San Pascual – Nangalesan and Asin Road which leads to Asin Hot Spring in Tuba, Benguet and Baguio City. DPWH is also implementing the Metro Manila Priority Bridges Seismic Improvement Project, which involves the retrofitting and reinforcement of the Guadalupe Bridge and Lambingan Bridge. It is set to start in 2019 and is targeted to be completed by 2021. 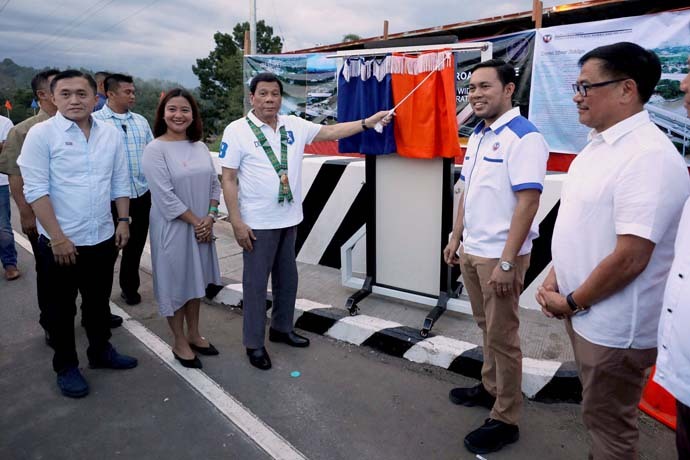 This will ensure the safety of about 365,000 motorists who use the Guadalupe Bridge and about 30,257 motorists who pass by the Lambingan Bridge every day. In addition to the 30 existing bridges crossing the Pasig and Marikina Rivers and the Manggahan Floodway, which cater to about 1.30 million vehicles daily, 12 new bridges will be constructed in the area to provide alternative linkages between major thoroughfares and increase the number of usable roadways that would decongest traffic in Epifanio de los Santos Avenue (EDSA) and other major roads in Metro Manila. As of today, we have completed the feasibility study of ten bridges under the Metro Manila Logistics Network, including North & South Harbor Bridge, Palanca-Villegas Bridge (Pasig River), Beata-Manalo Bridge (Pasig River), Blumentritt-Antipolo River, Eastbank-Westbank Bridge 1, J.P. Rizal – Lopez Jaena Bridge, J.P. Rizal – St. Mary Bridge, Marikina-Vista Real Bridge, Mercury-Evangelista Bridge, and Eastbank-Westbank Bridge 2 (Manggahan Floodway). Construction of the Bonifacio Global City-Ortigas Center Link Road Project has already started and is targeted to be completed in June 2020. This involves the construction of a 4 lane bridge spanning 633 meters across Pasig River linking Lawton Avenue in Makati City and Sta. Monica Street in Pasig City and a viaduct, spanning 344 meters traversing Lawton Avenue onwards to the entrance of Bonifacio Global City. This will decongest traffic along EDSA and C-5, particularly along the section of the Guadalupe and Bagong Ilog Bridges. As of June 2018, 13.79 percent of the project has been accomplished. It is targeted to be completed in June 2020.